Circo Massimo's Tauroctony – Mithraeum. Our Common Sun. White marble relief found in the hindmost room of the Mithraeum in 1931. End of the third century. The relief must have stood in a corner against the wall on a pedestal, as is clear from holes in the lower rim and in the back and moreover from a decoration only on the left and upper border. 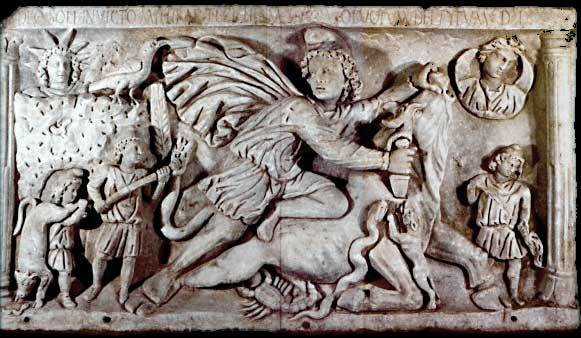 Mithras in tunica manicata and flying cloak is slaying the bull, whose tail ends in one great ear. On the point of the Phrygian cap a star; four more stars are visible to the right of the god's head. The dog and the serpent are licking the blood from the wound; the scorpion grasps the testicles. On either side stands a torch-bearer: Cautes (l) and Cautopates (r), not cross-legged. They are dressed in a tunica only. It is remarkable, that two Corinthian capitals behind them are turned in the same direction as their torches. Behind the main scene a grotto has been represented; on its border the raven is perched, which grasps with its break part of Mithras' cloak; furthermore a lizard is visible creeping out of its hole. Before the entrance to this grotto Mithras carrying the bull; before the bull's forelegs a serpent. In the upper corners the dressed bust of Sol with a crown of seven rays, and of Luna with a crescent behind the shoulders. Sh is looking downwards. On the upper border, above Mithras' head, a crown of leaves on either side of which runs a inscription. Dating: end of the III century A.D.